The Secret Society, a game developed by twin brothers from Yakutia, has become an international bestseller. 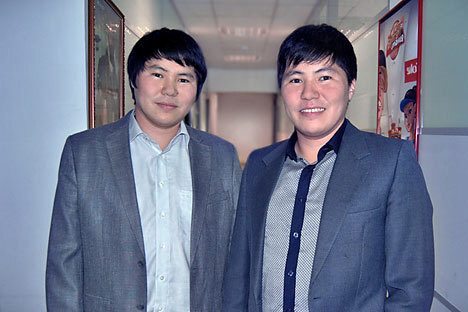 The Ushnitsky twins were born in Yakutia in a village in northeastern Siberia, where winter temperatures can drop to minus 60 degrees Celsius. Their game – The Secret Society – has been installed 15 million times from the App Store, Google Play and social networks. iPhone users alone bring the Ushnitsky brothers and the publisher $11,000 per day. How have the twins managed to conquer the international market from the coldest place on Earth? The village of Khonuu, where Alexei and Afanasy Ushnitsky were born, is considered one of the coldest places in the world. In their childhood they were holed up at home all winter and spent their days playing computer games. In 1996, the family moved from the village to Yakutsk. One day on their way home from school the brothers came across a copy of the “Strana Igr” magazine (also known as Gameland). There was an article by a developer in it. "It dawned upon us: games had to be made by someone," Alexei recollects. "The man wrote that he had a swimming pool in his office!" The Ushnitsky brothers went to the local library to learn how to write code. They mastered the simplest language Basic, followed by Pascal and Fortran. In 2003, at their father’s suggestion, Alexei got a job with the diamond production company EPL Diamond repairing computers. The chairman of the board, Pyotr Fyodorov, came from Israel. He examined the diamond stocktaking database and internal corporate chat service that Alexei had written and asked him to develop a game. A year later, the game Uolan Bootur, where a Yakut hero saves his bride, appeared on store shelves. But it did not sell. The brothers failed to realize at this point that they were competing with all of the games from around the world. Pyotr Fyodorov decided not to invest further. In 2005 the brothers borrowed 3,000 rubles from their father to put a deposit down on a computer. In two months, they created their first game, Boxy Goxy, which involved puzzles. The Ushnitsky brothers began to write to publishers – Big Fish Games, GameHouse and others. The American company Freeze Tag invited them to remake their game Boxy Goxy. It was re-released as an improved game called Xango Tango in 2008. Their work with Freeze Tag brought the brothers their first income. In 2009, they released the game Strange Cases, a detective story about an FBI agent with an important mission. Afanasy wrote it in a village during the New Year holidays. It became the number one entry on the list of Big Fish Games Top 100 for 13 days. In 2010, the brothers earned their first million dollars from their games. In 2011, everyone was talking about free-to-play, which is a type of video games for mobile devices and social networks, where most of the content is free (money is made through special features, such as buying extra lives for the hero). To produce free-to-play-games, the Ushnitsky brothers created a new company called MyTona in 2012. The brothers' biggest hit has been the hidden object game The Secret Society released in 2012 (hidden object games revolve around quests). It was published by G5, a Swedish company founded by Russians. The game became one of the top 10 games both at the App Store and Google Play. According to the Ushnitsky brothers, The Secret Society's main audience is women over 35 that play at night on their iPads. According to consulting firm Think Gaming, the company receives $11,000 from iPhones users daily, with 10,000 new users installing the game every day. The Secret Society game has brought the Ushnitsky brothers more than $10 million in sales. In April, MyTona will release two new free-to-play games in different versions. The first game – the puzzle Royal Journey – has already been launched in test mode in Canada. The second – Seeker's Notes, a hidden object game – is now being considered by Apple. The Ushnitsky brothers plan to create several localized versions for different countries. For example, in China and Japan, the game will feature a female anime character. For the first time, MyTona is doing its own marketing and promotion without the help of external publishers. The brothers have no plans to leave Yakutsk, where their families and friends live. Conquering the world from the ends of the Earth is just fine for the Ushnitsky brothers as they can take a break from developing new games to go hunting or fishing any day of the week. First published in Russian in Sekret Firmy magazine.